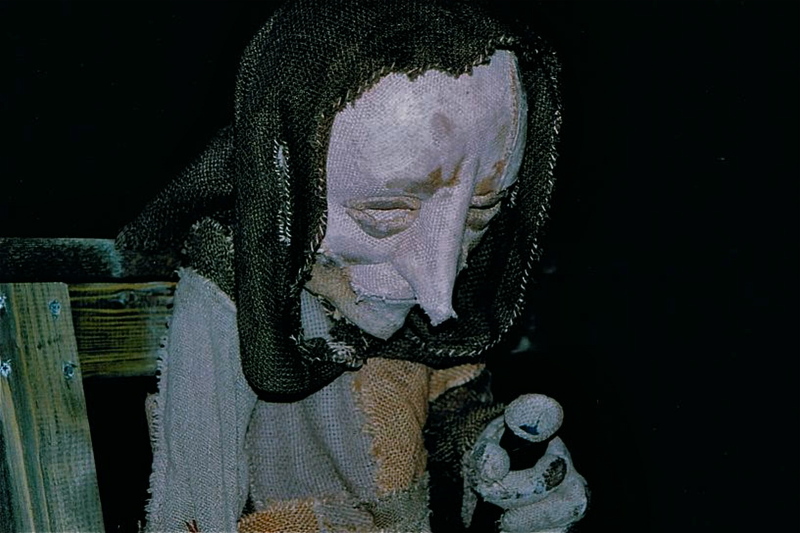 We Come Humbly Beseeching You Like this Poor Puppet from the Groteska Theatre Production of Balladyna in Krakow 2005. Okay I have a confession. I’m stuck. I need help. I did this crowdfunding dance two years ago and it was so hard I swore I’d never do it again, but I made it. This time it’s much harder. On the evidence of 75 percent of the people who contributed to my last attempt to raise funds, the world is in a global recession deeper than anything since the great depression. I thought the recession was supposed to be bad back in 2009 and 2010. But this time, with a few happy exceptions, the majority of folks who seemed so supportive back in 2012 are in some kind of financial straights so bad that all I’m getting is exactly the kind of ‘I-wish-I-could-help-but’ notes that make one look a little too long into the dark water down at the dock at midnight. Or in a more pleasant variation, ‘this-is-all-we-can-afford-now’, and I graciously receive about a quarter of what I might have been given before. And it’s not one or two people. And it’s not one kind of person or just Americans. 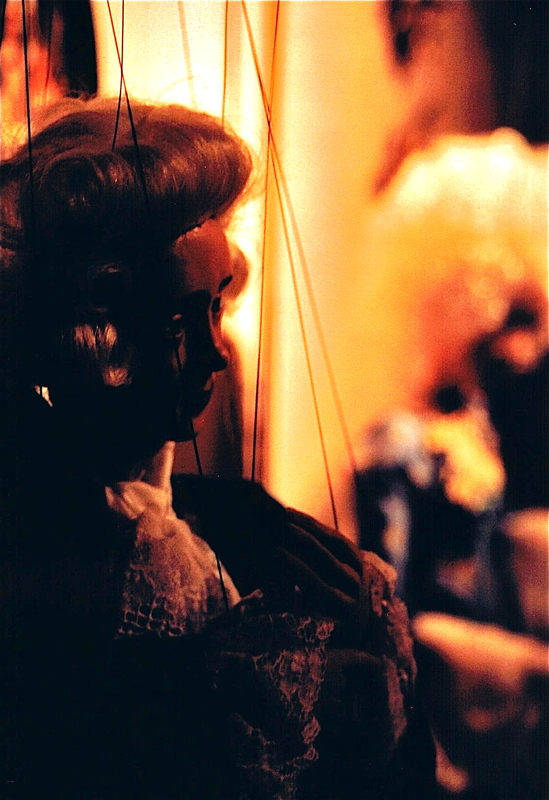 This Mozart Puppet From the Salzburg Marionette Theater in Salzburg Has a Wistful Expression. Maybe it’s Because He’s So Poor that They are Going to Have to Bury Him in a Pauper’s Grave AND He Never Supported GRAVITY FROM ABOVE. Oh My!!! Now I believe my friends and begrudge no one a dime. This must be a weird time for quite a few people. And I wonder about my timing. But then again by all reckoning the autumn is the best time to fund raise. But actually in Alaska summer is usually better. But many of these people don’t live in Alaska. Or maybe this whole crowdfunding thing is just getting overplayed and people are just giving too much to too many people. Or maybe it’s the lack of me? (How’s this for a convoluted theory that might actually be closer to the truth.) I mean, actually all this social networking doesn’t make you closer to people. And the occasional ‘Like’ doesn’t mean anyone is all that involved in anything you do. And so you think maybe people will understand why puppets might be helpful in this weird world. But then I think how can they? They haven’t read any books or essays on the subject. They probably have never seen a decent puppet show. And they certainly haven’t seen my film, because I’m having trouble finding the resources to make it. So it’s probably not me personally, it’s the ‘not me’ which makes me just another cluster of digital pixels. 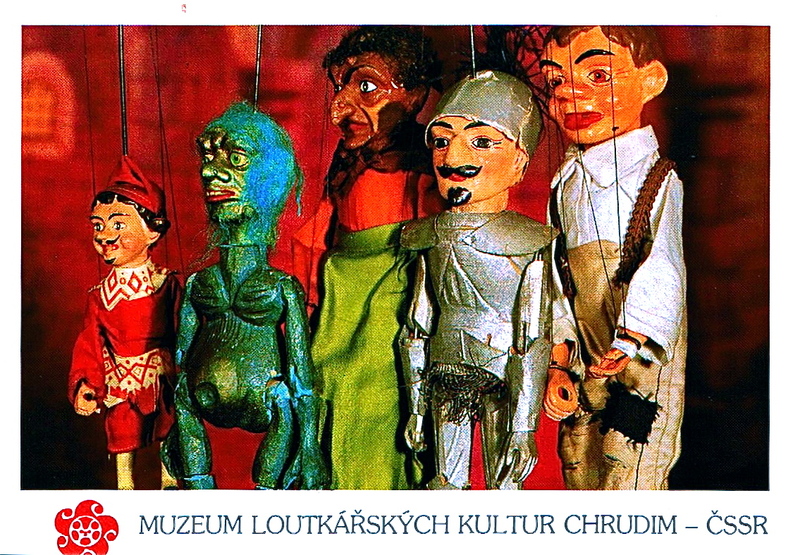 A Few Old Czech Puppets Hanging by a String in the Czech Puppetry Museum in Chrudim Just Waiting to Have Their Stories Told! Now I’m not down and out on this project yet. I pushed the deadline back to December 18th. And I’m right on the edge of 15% of my total. (And if it gets really desperate I have one last January fallback position.) But I must say my plan to raise my money has been largely scuttled by these odd collective financial difficulties. I had planned to raise a certain amount through my friends and supporters from last time. Then to use that momentum to keep the ball rolling. There are also some other differences between then and now that I won’t burden you with, but they are differences that add up. But it’s also clear that I have to change my strategy. And I need help with ideas of how to do that. One thing that I do have this time, that I didn’t have last time, is that more puppeteers and folks in general know about the project. Since I started doing this over 100 people have joined my Facebook page for Gravity From Above. Yet while I have received some very enthusiastic thumbs up, except for a few generous people, that hasn’t yet translated into anything financial. Maybe it’s because puppeteers are a fairly low rent breed and are also just scraping by. And yet I know also most anyone could make a 5 dollar, 5 Pound, 5 Peso, 5 Euro contribution and believe it or not little contributions add up and eventually inspire more money. So if each of those people gave $5 dollars I’d be up $500. Now that’s not likely to happen for the same reason that statistically most people will not give to anything. But wouldn’t it be great to buck the statistics! And this is a case where it should happen. (For the reasons I gave in my last essay.) Really. But Really We Are Just Puppets What Can We Do? 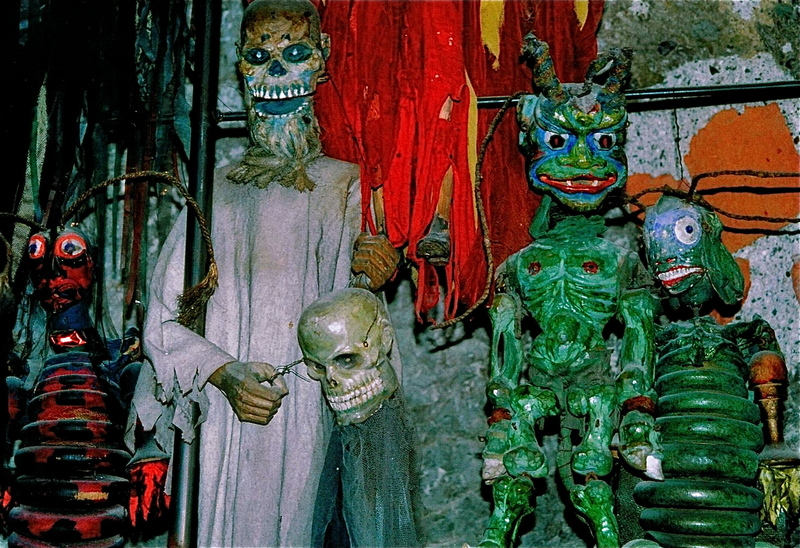 These Puppets in Storage at Theatre Groteska in Krakow Poland Seemed to be Asking in 2005. But here’s a thought for my friends who truly are strapped for cash and can’t afford anything at all. Help me in other ways. Sharing on Facebook etc is an obvious way. But in the end that produces the same low return. It’s just the numbers. But here’s where it counts. I’ve got a temporarily tax deductible project that is wildly unique and visually arresting. Gravity From Above is the very opposite of dumbing down and adding to the chaos of the present. This isn’t more noise. This film is a bid for people to try to find a way through the virtual gunk that clogs us up at every turn. It’s about reality, and how to connect people to it. Surely somebody must know somebody who can help with financing? This is where you can help. You have a friend here (me) and someone trying to get something done that needs to get done. It quite literally won’t get made if you don’t help. If you are a puppeteer you should really be starting to understand what this project is about. So think with me. Work with me. Whoever you are? Even if you’re broke as I am. Look around. Who do you know who does have money that can help? Do you know an organization that can help? Does anyone know anyone who is willing to take very little risk, since it’s tax deductible, to help get this made? I don’t need people who say things like, “Hey have you looked into the Henson organization or the NEA or ARTE etc etc.” Helpful, but ultimately obvious. I need people who will look into those things themselves on behalf of this project. (If anyone brings in a live fish they will get some kind of Producer credit.) Who are your relatives? Friends? Employers? Associations? Or let me ask another question: I’ve been working on this project in varying degrees for something like eight years. I’ve got a start, but nowhere near where I need to be. Am I the only one who sees the need for this? (I might be, because few people, even in Europe, have seen what I have and put the larger picture together.) Does anyone else want to see this film besides me? Seriously? (If you’ve given this time or in 2012 you are excused and have proved yourself.) I believe there are people reading this who do? So even if you really and truly don’t even have a couple of dollars to help out, get creative and think with me. How can I seriously raise this money before December 18th? I realize I’ve probably violated some rule for fundraising here. The rule that says you are always supposed to remain confident. Well I am confident. I am also realistic. I’d rather seek your help now than wait until five minutes to midnight. I can recognize that my own resources are starting to get thin. But I’m fully confident that someone out there has a piece of the puzzle that I need. If you have ideas? Connections? Encouragement? Etc? Write to me at reckoningmotions (at) yahoo (d ot) com or at my Facebook account or below in the comments section. Or heck! Just get your helpful soul over to Hatchfund and throw a few coins in the hat. This is not surrender. This is a fight to preserve the meaning of this project. By the way if anyone wants a kit with photos and narrative of the project to use let me know.